Randolph Street Market today and tomorrow. Go check it out! If you have some time today from 10 – 5PM or tomorrow from 10 – 4PM head on over to the West Loop at 1350 W. Randolph Street for the Randolph Street Market. 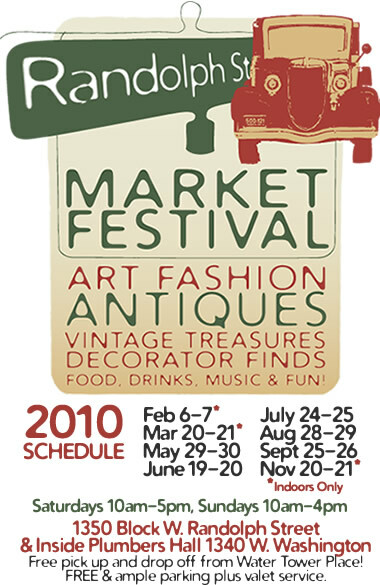 If you have the slightest desire to see a bunch of art, fashion, antiques, food, music, and drinks then you won’t be disappointed! Check out Randolph Street Market’s website! Register to win HGTV’s Dream Home 2010 now till February 19th! Ever wanted to win a brand new, sustainable, and literal dream home in the mountains of New Mexico? Well here’s your chance to win that…and more. Talk about $500,000, a brand new 2010 GMC Terrain and a lot more with a prize totaling over $2 million from HGTV. Not bad eh? Just check out HGTV’s Dream Home website where you can sign up once a day until February 19th. If anyone wins, can I come visit at least once and take advantage of your $2 million prize? Photos courtesy of HGTV’s website. 2nd Fridays artwalk is tonight in the Chicago Arts District/Pilsen neighborhood! I haven’t gone to the 2nd Friday’s art walks for the past few months but now that my mom is visiting from out of town, my sister and I decided to take her there. Go eat some dinner in the neighborhood then walk around and take a look at some weird and expensive art…luckily not all of the art is weird and expensive. Also note that this last sentence is coming from someone who is not very insightful and would rather spend money on things other than art. If you have no idea what 2nd Friday’s is, there are a bunch of art galleries centered around 18th and Halsted Streets in Chicago’s Pilsen neighborhood. This group of art galleries and shops is formally named the Chicago Arts District. Once a month, all of these art galleries open their doors to the public and people walk in and out of them looking at the artists’ pieces. Plus, there’s usually wine, beer, and snacks in each gallery…they accept donations for them so don’t be cheap. Free wine seminar with Lush Wine & Spirits and Belgravia Group’s Hartland Park Townhomes! Tonight at 7pm, Belgravia Group’s Hartland Park Townhomes is hosting a complimentary wine seminar in their model home, located at 1721 W. Schubert Avenue in Chicago’s Lincoln Park neighborhood. Lush Wine & Spirits brings the wine and one of their fun and knowledable employees to teach a seminar that feels nothing like a class…well, because it’s fun and I haven’t ever had wine during a class. Some good food will be there and of course, you can’t beat the free wine can you? To RSVP give Hartland Park a call at 773-935-0523. Iron Man playing in Kinzie Park at dusk! I’m pretty excited for my very first movie in the park experience and to top it off, they’re playing Iron Man. In case you have no idea where Kinzie Park is, it’s located at Kinzie and DesPlaines Streets in the Fulton River District. The movie starts at dusk which, according to weather.com, is at 7:56PM. Nothing says movie in the park like smuggling beer or wine in a water bottle! FREE and private art tour with Union Row Townhomes and the Chicago Art Department. Union Row’s upcoming 2nd Fridays event is taking place on Friday, July 10th so we can’t wait to see you there! 2nd Fridays take place in the Chicago Arts District where dozens of unique art galleries open their doors to the public to showcase their hard work. What’s even better is that everything is free…unless you buy a piece of art, and the galleries always have some free wine and food too. Everyone will be meeting at Union Row’s model home, located at 644 W. 16th Street, at 7pm for some wine and snacks. Around 730pm we’ll walk over to the Chicago Art Department for our private tour. To RSVP for the art gallery tour, give Union Row a call at 312-829-4600! Beer tasting at Belgravia Group’s Union Row Townhomes Thursday night. Normally, Belgravia Group’s Union Row Townhomes teams up with Lush Wine & Spirits for a wine seminar but we decided to switch it up a bit and have a beer tasting. I, for one, am excited! The beer tasting will take place at Union Row’s model home, located at 644 W. 16th Street, and will go from 7:00pm -8:30pm. Like always, there will be good food and the seminars are free which is a perfect reason to invite friends to come along with you. If you plan on attending, just give Union Row a call at 312-829-4600 to RSVP. It’s that time again, 2nd Friday’s art walk with Union Row Townhomes! This Friday, Belgravia Group’s Union Row Townhomes will partner up with an art gallery called Logsdon 1909 for this month’s 2nd Friday’s art walk. Everyone is going to meet up at Union Row’s model home, located at 644 W. 16th Street, at 7pm for some wine and then around 730pm we’ll all walk over to Logsdon 1909 for our private gallery showing. These 2nd Friday’s art walks are located in the Chicago Arts District. At these art walks, dozens of different galleries open their doors to the public where you can literally walk in and take a look at some pretty unique art. Sometimes, the galleries will even have some more wine and food for visitors. The event is totally free which is a perfect excuse to invite your friends and family…plus the weather is supposed to be really nice…another reason to go. If you do plan on stopping by, give Union Row a call at 312-829-4600. Free wine tasting with Belgravia Group’s Union Row Townhomes and Lush Wine & Spirits! 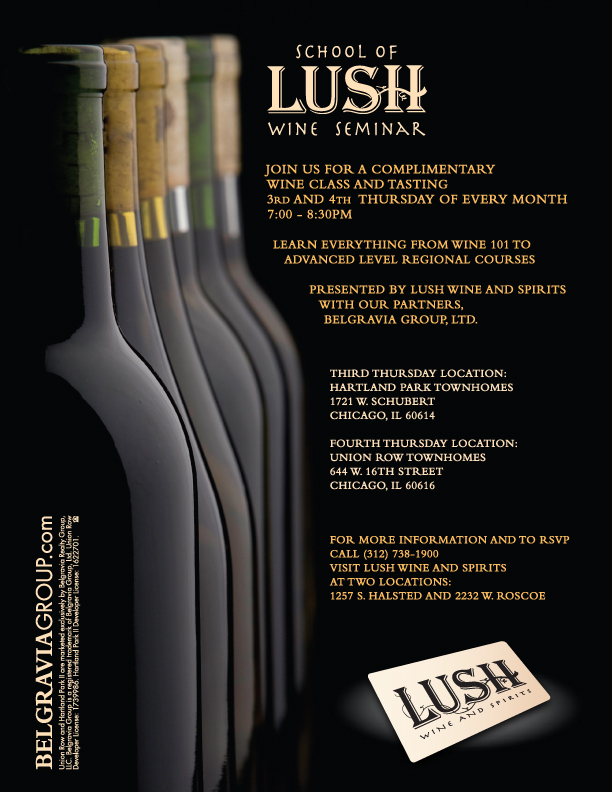 What: Complimentary wine seminar/tasting with Belgravia Group’s Union Row Townhomes and Lush Wine & Spirits! When: Tonight, May 28th from 7 – 8:30pm. Where: Union Row’s model home which is located at 644 W. 16th Street in Chicago. Why: Because it’s free, and there’s wine…what else do you need to know?! Please feel free to invite your friends and family because everyone is invited. If you have any questions or would like to RSVP to the event, give Union Row a call at 312-829-4600. If you are unable to attend this month’s wine seminar, don’t worry, they take place on the fourth Thursday of every month at Union Row Townhomes. Wine seminar at Belgravia Group’s Hartland Park Townhomes and Lush Wine & Spirits! One of Belgravia Group’s townhome developments, Hartland Park II, will be partnering up with Lush Wine & Spirits to host a complimentary wine seminar this Thursday night, May 21st from 7pm – 8:30pm. These monthly wine seminars take place the third Thursday of every month at Hartland Park II’s sales center, which is located at 1721 W. Schubert Avenue. Again, this is a free event so bring your friends and family with. It’s always a fun time and you will even walk away with a bit of knowledge about wine at the end of the night. Hartland Park II’s sales center is open 7 days a week from 10am – 6pm so stop in to take a look or give them a call at (773) 935-0523!